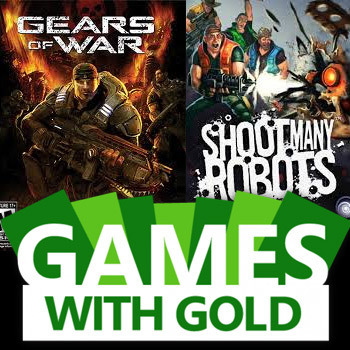 Next month, Xbox LIVE Gold subscribers will receive a complimentary copy of Gears of War and Shoot Many Robots. Microsoft has finally unveiled the titles that will make up next month's Games with Gold catalog. Starting on December 1st, Xbox LIVE Gold members will be given access to Gears of War, the 2006 classic by Epic Games. Then on December 16th, Shoot Many Robots, an action platformer from Demiurge Studios, will hit the Games with Gold library. If you haven't already played Gears of War, Microsoft is giving you the chance to finally check out one of the most important titles on the Xbox 360. Gears of War was a major influence on modern-day shooters, and its sequels continue to be best sellers. So, even if you're not a huge fan of cover-based shooters, you should check it out for posterity's sake. Shoot Many Robots, on the other hand, is far less illustrious or historically important. The game's mechanics and storyline are summed up by the title, so if you dig the title, you'll probably enjoy the game. Unfortunately, Microsoft hasn't revealed its strategy for Games with Gold on the Xbox One. The developer is reportedly planning to launch its Gold catalog in 2014, but that's all we really know. The Xbox One doesn't have a huge library at the moment, so Microsoft will need to make some tough decisions. Either way, Gears of War and Shoot Many Robots should tide you over until January.